Learn more about Spatial's 2016 1.0 Service Pack, Live Webinars, 3D Insiders' Summit, and blog posts on leading-edge Industry topics. 2016 1.0 Service Pack is Here! The release of 2016 1.0 Service Pack delivers a number of new features and process enhancements to our users. Dassault Systèmes’ CATIA allows assemblies to have multiple instances of a subassembly with different positioning of the components within that sub-assembly. Each instance of the subassembly is linked, so that structural changes to one are reflected in the others. However, the positioning of each subassembly can be modified independently of the others (see graphic). This ability to independently modify the positioning of a linked sub-assembly is referred to as a flexible assembly. 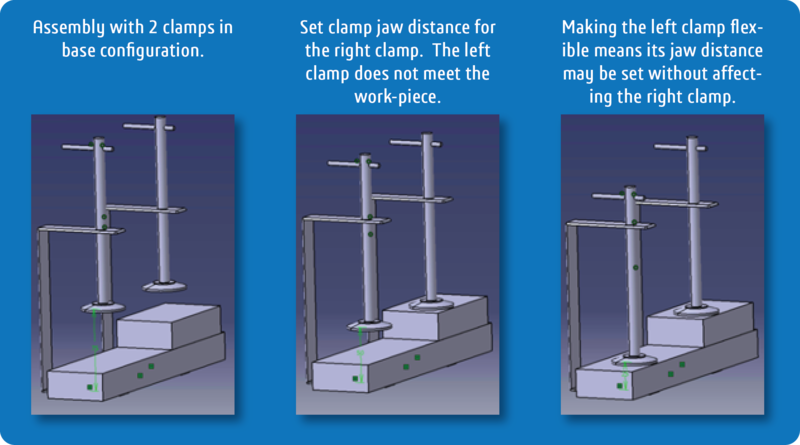 For example, in an assembly with two clamps used to locate a work-piece, the clamp subassembly might have a dimension to control the distance between jaws. The two instances of this clamp may require different settings of that dimension to make contact with the work-piece, but the structural definition of both clamps remain identical. This service pack delivers support for such flexible assemblies. Hole features in CAD systems are usually defined by the same set of dimensions as are required for the manufacture of that hole, typically depths and diameters. Combining these dimensions into a single piece of manufacturing information makes it easier to read and manage. This type of combined dimension is referred to as a compound feature dimension or a combined callout. Unigraphics’ NX supports these compound feature dimensions for holes. All the dimensions associated with a feature are combined into a single product manufacture information (PMI) element. While 3D InterOp R2016 1.0 supported graphical translation of this style of PMI, this service pack adds semantic support to provide the definition data as well as the display. Improved the assembly load performance in assembly load of loading CATProduct files for InterOp/CGM users. PMI authoring APIs added. Interfaces are now available for creating graphical annotations in the InterOp graphical scene graph. Operating system restrictions on file size have been removed to now support full 64-bit STL-format files. Material property support has been added for Solid Edge files. Microsoft has enabled automatic updates to Windows 10 for some users, and we wanted to ensure that you are aware of their update practices and the potential impact to your users. You can find information about the Microsoft Product Support Lifecycle, here. As a reminder to our notification in September, 2015, Spatial is supporting Windows 10 64-bit installations with the current 2016 Release. We will not be providing 32-bit packages for Windows 10. For more information about our platform support, please refer to the Release Notes on our documentation site. Precise geometric modelers are at the essence of the innovations achieved by the design, manufacturing, analysis and measurement domains over the past several decades. If one needs to design or model with organic entities, scanned data, point clouds or other non-precise representations, polyhedral modeling is required and is becoming common. But what do you do when you need to model with both precise and polygonal representations? Welcome to hybrid modeling. How does hybrid modeling enable the fourth industrial revolution? What current workflows does hybrid modeling deliver? What innovations can hybrid modeling enable in the next few years? This year’s 3D Insider’s Summit is scheduled for September 28th to 29th and will be held at the Renaissance Boulder Flatiron Hotel. This is a chance for you to receive hands-on technical training, learn about new features, and meet one-on-one with our technical experts at the Broomfield, Colorado venue. In addition to presentations on the direction of the industry and Spatial solutions, bring your laptop and be prepared for deep-dive technical classes to learn best practices, experience new capabilities in the software, and customize our software to achieve your goals. These interactive educational labs will guide attendees step by step through the process of implementing new capabilities and workflows — all with the goal of helping you innovate new solutions. More Blog Posts Coming Your Way! You may have noticed that 2016 ushered in a new era of blogging at Spatial. On a more or less weekly basis (hey, it is a blog), we publish our view on industry trends, emerging technology, or just interesting bits of technology. 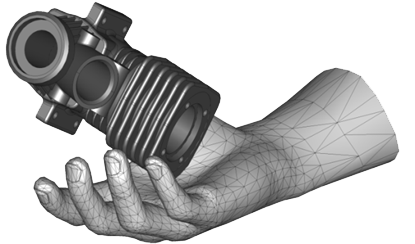 For example, one of our recent blog posts, The Impact of Model-Based Definition (MBD) on 3D Modeling and Manufacturing, discussed the impact of MBD is having on how we design and manufacture everything.